Busy, busy, busy......Happy Holidays to everyone!! Wow! No kidding that you've been busybusy! Beautiful work. I love the mouse pin cusions! I aspire to be you!! Great work!! You are so creative! And so very talented. 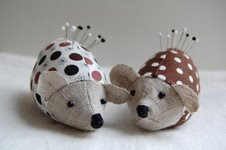 I love the "slippers" and the pin cushion mice. The dolls are just too cute. How pretty! Love the prairie points and the mice! The dolls are really cute. You have been busy! I love the pin cushions and house shoes! I also wanted to let you know Patch work pjs is now http://tuesdaysattonyas.blogspot.com Sorry for the inconvience of changing things up. Love your work! I am a quilter myself, and I am just nuts about dolls of all kinds. These are precious! I just sent you an email. Please let me know what's going on. i have just read your last few blogs. whew! love everything on this post were those all christmas gifts, lucky recipents. the slippers and pin cushions are my personal favs. your tree dilema. i have six children, most teens and grown but now come the grands. i have always had least two trees, one the kids help with and one i take my time on and the little hands know they can not touch. it works out pretty well and they learn. too bad about the grouchy commenter on your blog afterall it is a "give"away. meaning free stuff. just shake off the dust and go on and do it the way you feel is fair. you are making the rules right>? Your post about the giveaway was crystal clear. Don't worry about the naysayers. wow, what lovely work!!! such and inspiration! Beautiful pictures; I especially love your citrus table runner. Congratulations on your great news.